The range of rustic- and country-inspired themes is one of the most enjoyable aspects of modern weddings. The mason jar has emerged as a predominant detail. Not only is it fun to drink from, but the container is also a natural for wedding decorations. 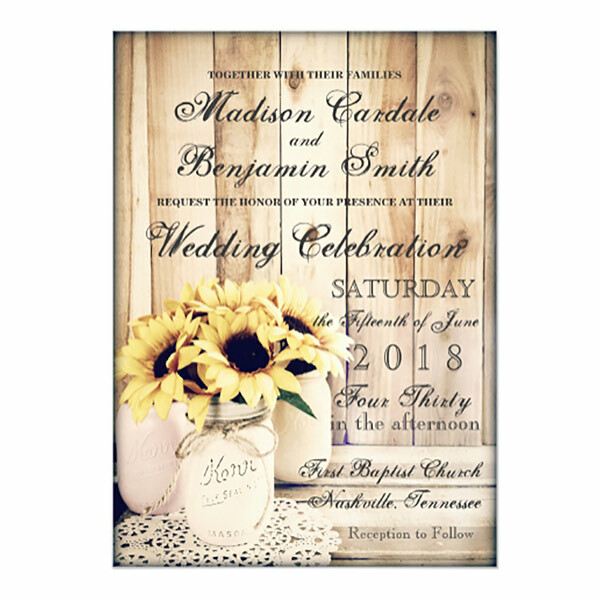 And, as with most wedding decor, it has made its way onto invitation and save the date designs. 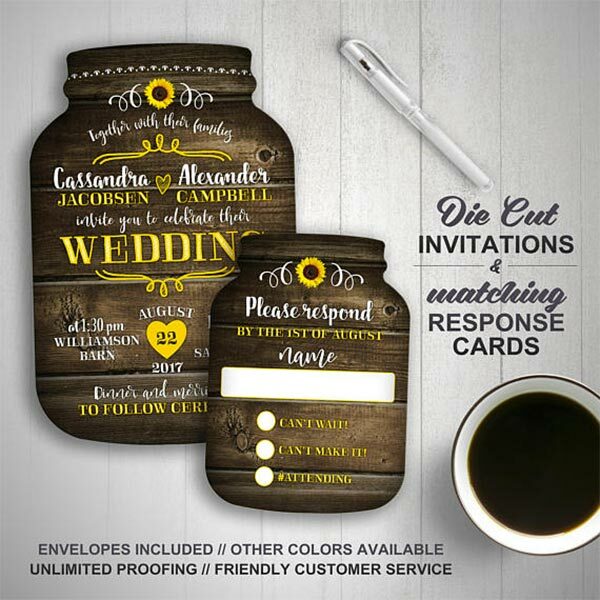 Here are ten different mason jar wedding invitation styles you will enjoy. I’ve also included one or two examples of each. 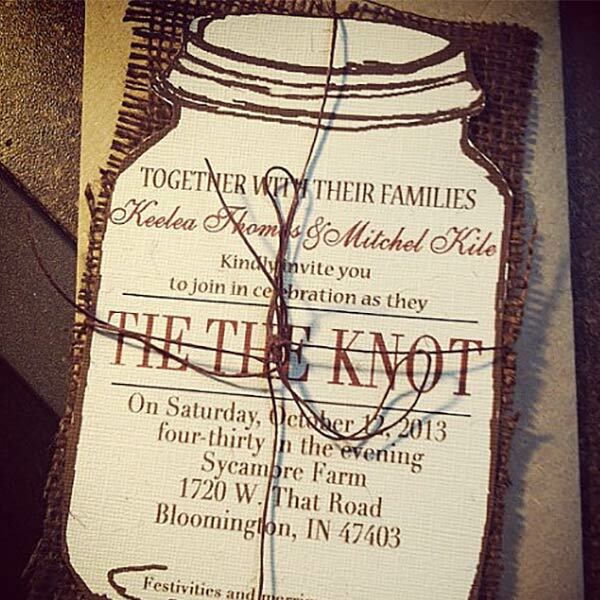 Find more mason jar wedding invitation inspiration here. Because barns are often a venue for farm weddings, it is only natural to use wood grain in the design. As you can see from some of the examples, wood backgrounds are common. Here are two unique takes on the theme. The textural appearance of burlap makes it popular for use as table clothes or runners. 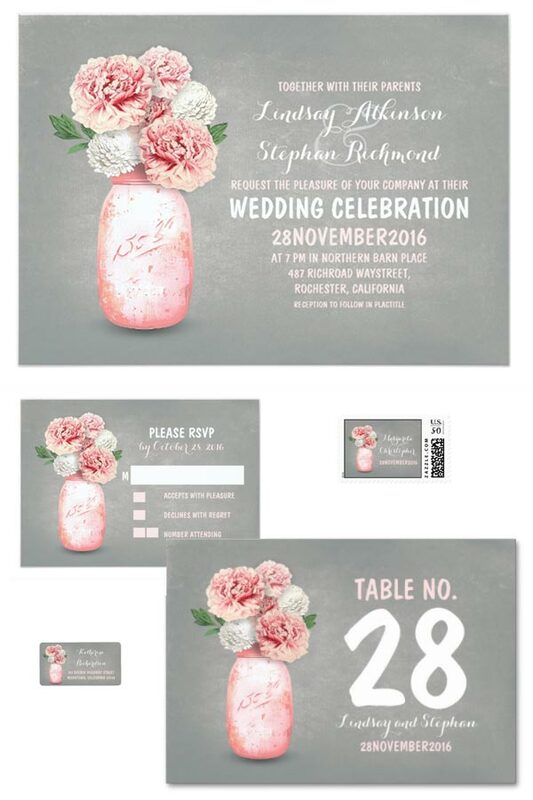 For the same reason, the fabric is an interesting backdrop to jars on an invite. Personalize photo cards are popular. 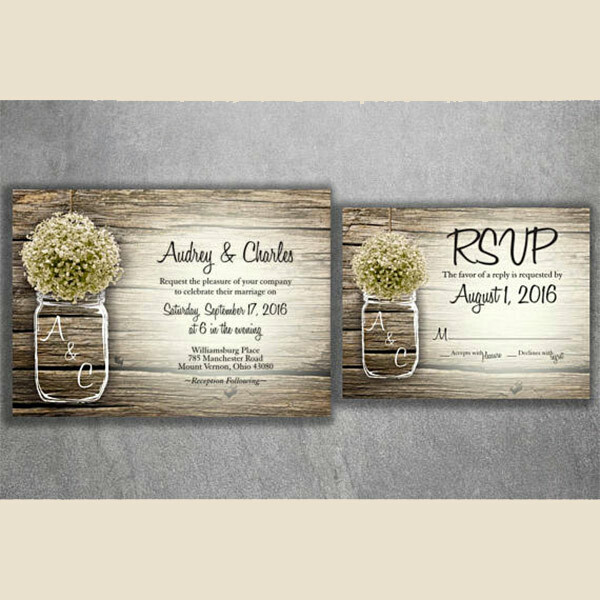 Combine them with the mason jar or other country designs and you have a cute rustic invitation. Barns, fields, and yards all generally need extra sources of light. Provide them by placing or stringing led, candle, or electric lights into jars. Both functional and more interesting to look at than your run-of-the-mill light strand. Whether modern or older looking, lace softens the often course textures in a rustic theme. This design has the lace doily as part of the decoration under the mason jar. 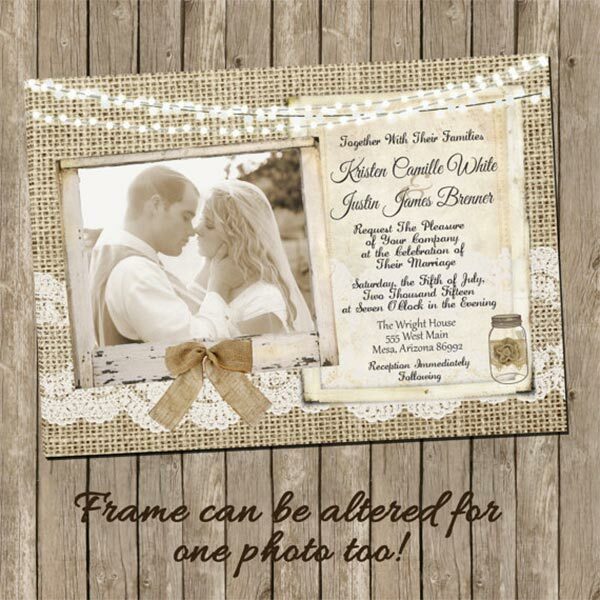 It also features flowers, another popular element in mason jar invitation. I’m certain you have picked up on this already, but I’ll say it anyway: mason jars make awesome flower vases. 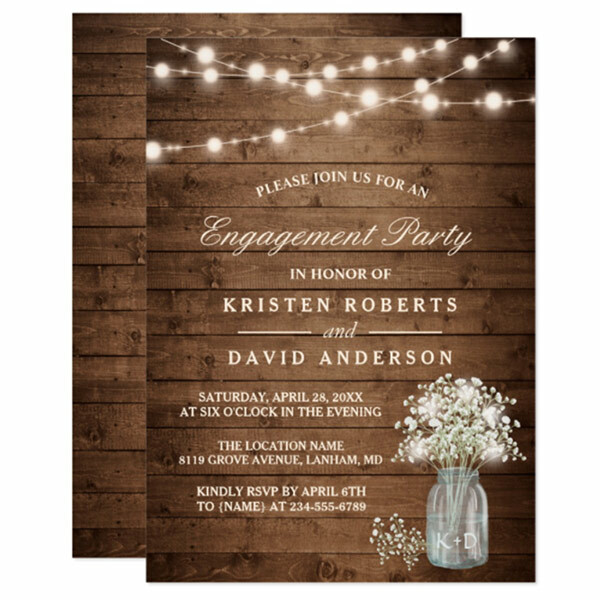 And flowers are probably the number one design component in invitations. Baby’s breath is a common flower paired with mason jars for a couple of reasons. The small, white flowers go very well with rustic decor, and they are very inexpensive. 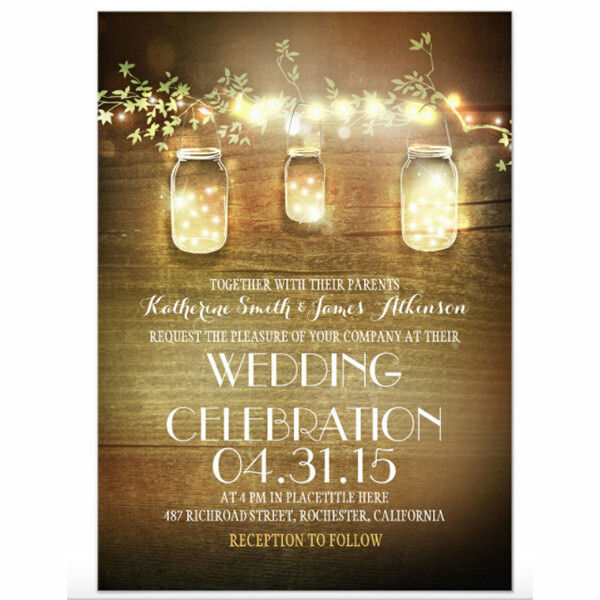 Speaking of inexpensive, you cannot go wrong on a very tight budget with this invite. The invitation, complete with an envelope and RSVP postcard, is less than a dollar for each set. 7. Hanging from tree branches. Lacking walls and a ceiling, outdoor weddings can present a unique decorating challenge. Many solve this dilemma by dangling various items from the trees. Happily, the same technique is also cute on wedding invitations. Painting a mason jar can take it from average to amazing. This also opens wedding card design to new possibilities. 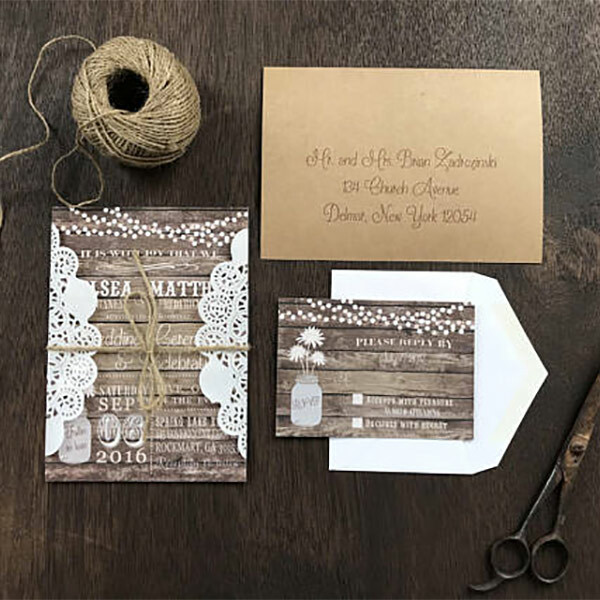 You can also buy invitations die cut to match the shape of a mason jar. 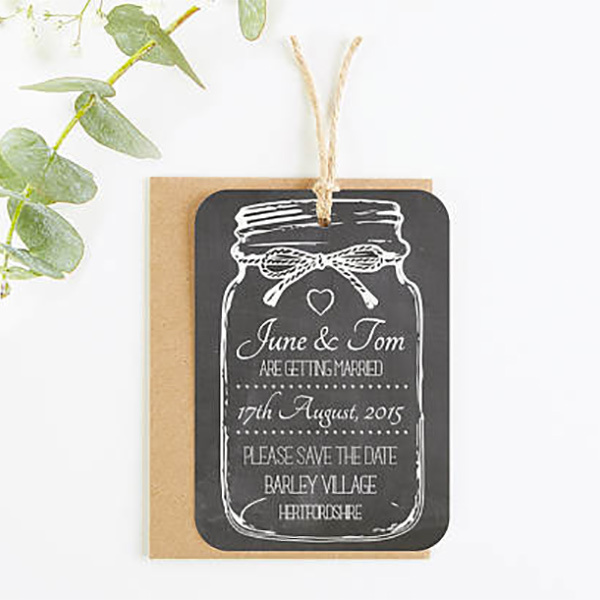 The chalkboard look is another rustic wedding twist. 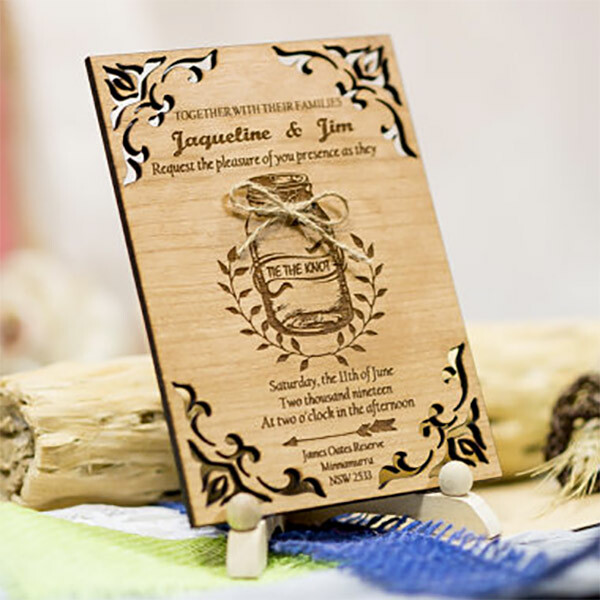 If this appeals to you, why not the drawn-on-board look for your mason jar invites or save the dates?